With baking I have found that the most simple dishes are often the most delicious ones. But with this cake I discovered that sometimes the biggest fails can be turned into something wonderful. This recipe was originally a Banana Whoopie Pies recipe. I made the batter according to the instructions but as soon as I placed it into the oven, it became clear that the batter was too runny to be used as a whoopie pie cake. So, while the batter was still runny and less than 5 minutes into the oven, I scooped it into a Bundt pan and out came a moist, dense banana cake. Rating: 4.5 out of 5. - Preheat oven to 350 degrees. Butter a Bundt cake pan. Sift flour, baking powder, baking soda, and salt into a bowl. Combine banana and sour cream in another bowl. - Beat butter and granulated and brown sugars with a mixer on medium-high speed, until pale and creamy, about 3 minutes. Add egg and ½ teaspoon vanilla, beating until incorporated. Add banana mixture in 2 additions, alternating with flour mixture. - Pour batter into Bundt pan. Bake until edges are golden, about 35 - 40 minutes. Cool cake to room temperature. - Beat cream cheese, confectioners' sugar, lemon juice, and remaining ½ teaspoon vanilla with a mixer on medium speed until smooth. 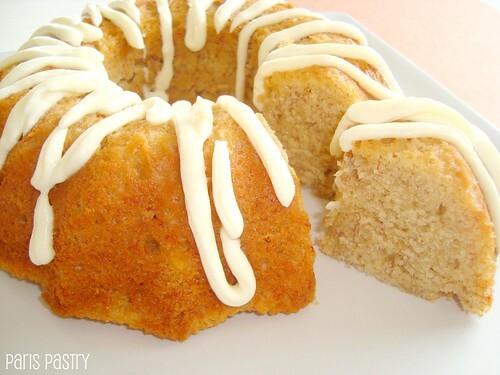 Drizzle glaze over Bundt cake. This looks delicious! 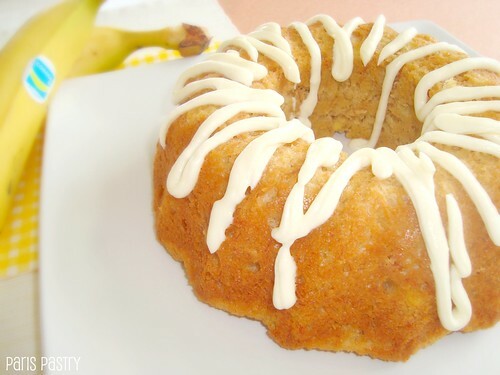 I love banana desserts, and I'm so hungry right now that I am considering heading to the store to get what I would need to make this delightful treat! you are our her0-ette! I love those moments when we are inspired and DO NOT WASTE THE INGREDIENTS!!! thanx for gorgeous photos! Great way to transform a fail into something ridiculously delicous! !